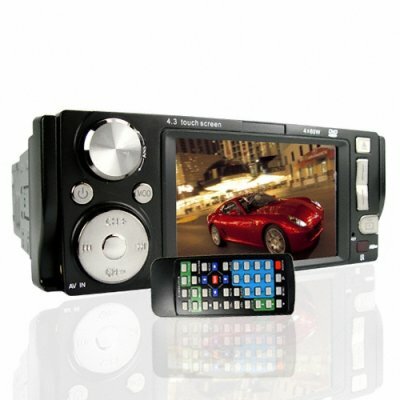 Successfully Added Outstanding 4.3 Inch Touchscreen Bluetooth Car DVD + TV to your Shopping Cart. Outstanding 4.3 inch touchscreen car DVD player with Bluetooth and analog TV. Single DIN sized (50mm tall) multi media center and call center for your car or road vehicle. This touch screen car entertainment center has a host of great features; 4-channel 45W sound output, the ability to play many disc and file types (including CD, DVD, MP3, etc), AM/FM radio with easy favorites, analog TV, detachable faceplate, and Bluetooth connection manager for handsfree calls while on the road. With touch screen control for easy feature navigation and its rich selection of media capabilities, the CVSA-415 is the perfect companion for the everyday commute as well as long road trips. A great wholesale price makes this unit perfect for the resale market, VAR market, or simple persona/company use. As always, it is only available from your source for wholesale direct from China electronic products, Chinavasion. The 4.3 Inch Touchscreen Bluetooth Car DVD + TV is perfect for the person looking for a budget upgrade to their vehicle. Includes an analog TV receiver. Allows your passengers to watch digital TV while you are driving everyone home.